The technology to manage and leverage data is changing so rapidly that traditional categories like business intelligence are evolving to accommodate more dynamic and complete software products. One such category that has emerged is self-service business intelligence. With self-service bi, business users are able to filter, segment, and analyze their data like never before, without the in-depth technical knowledge that most analytical systems have required in the past. But as technology changes and user needs evolve, it begs the question–what exactly is Self-Service BI in 2017? Domo’s Eric Buckley interviewed Wayne Eckerson to answer just that. Read below to hear Wayne’s answers to some fundamental questions regarding self-service analytics & BI in today’s market. Wayne Eckerson is Principal Consultant at the Eckerson Group, and has been a thought leader in the self-service business intelligence and analytics space for the past 15 years. Wayne specializes in coaching businesses to leverage data and technology for better insights and results. 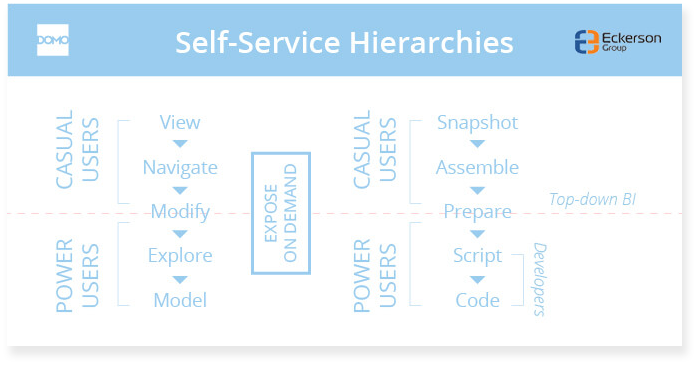 How do you develop a self-service framework? Wayne’s recommended framework has two types of classification: user type and functionality hierarchy, each of which is further divided into two subcategories. The process is straightforward. First, identify who your users are. Second, identify how they use BI. Step 1: Identify your users. 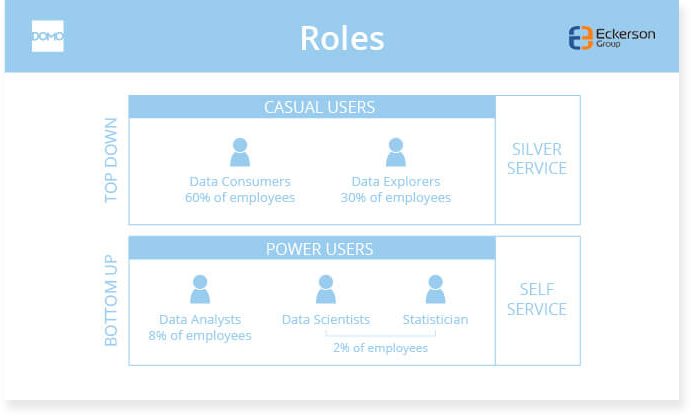 Who are your “casual users,” such as employees and managers, and who are your “power users,” like data scientists and software developers? Casual users just want to pop in and pull some reports or view their KPI dashboard. Eckerson calls these “silver service” users, because the right platform will deliver information, reporting, and functionality “on a silver platter,” tailored to their role and its day-to-day needs. “The other group – which is really just 10% of your users at best – consists of the power users who really do need self-service. These power users need true ad hoc self-service toolsets and access to data analysts. These are your data scientists and computer scientists who have that training, who can program, programmatically access data, and ideally create analytical or predictive models as well,” Wayne explains. Step 2: Specify how they use (or want to use) BI. Self-service platforms give users the ability to “expose on demand” – that is, the ability to click a single icon that reveals all the ad hoc capabilities available for making their dream BI platform. What are the benefits of self-service business intelligence? For business users: No backlogs, waiting, or mismatches. Enhanced control, agility, and speed. For your IT department: Offload work, agile delivery, quicker changes, and a drilled-down focus on data and models. Frankly, put – happier users! What are the drawbacks of self-service business intelligence? Duplicate, untrustworthy reports: When efforts are uncoordinated and lacking in strategy, you’ll end up with a mess of duplicate reports and dashboards, which creates mistrust around your data. And what’s the point of untrustworthy data? Data-extract hell: In other cases of power users “painting the town red” with their new capabilities, many will create an influx of data extracts to support certain self-service reporting tools. But this doesn’t fix the problem – rather, it shifts the bottleneck down a peg, from creating the report to just creating the dataset to populate the report. Shadow reporting systems: If Jim in IT created your system by himself on a shoestring, what happens if he leaves the company? Even if he stays forever, these fragile systems can break, fail to scale, and compromise security, leading to extra risks and costs. You know what you need from your self-service tools, now let Domo deliver the ideal system to your fingertips. Give Domo a try for free here!